I changed my name to Stana in May, but I was not sure how to pronounce my new name. 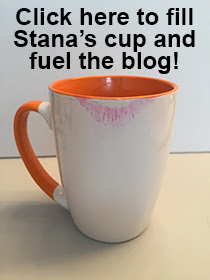 Did "Stana" rhyme with "Donna" or "Hannah"? I searched the Internet for an answer, but did not find it. Since then, people have asked me how to pronounce my name. I told them that the jury was still out deciding the question. Yesterday, the question came up again, so I searched the Internet again. I found the answer on YouTube, which now has a small collection of videos showing actress Stana Katic appearing as a guest on a variety of television talk shows. On each show, the host or hostess pronounced "Stana" by rhyming it with "Donna" and not "Hannah." I think she looks fine. In fact, her outfit reminds me of this one, which received rave reviews and nary a discouraging word. It's not like Ms. Storm is working in a profession where conservative attire is the norm. Give me a break. She is a television sports announcer, not an investment broker or a rocket scientist! By the way, Hannah is 5'10" tall, so I added her to my Famous Females of Height List. I fully agree that Stana should rhyme with Donna. That's the way I first thought it would sound. But maybe spell it Stanna? Just a thought. Oh, and by the way, thank you so much for covering the Fantasia Fair in P-town this year. I so do miss it up there in the fall. "...where conservative attire is the norm... or a rocket scientist!" I must say as a rocket scientist that conservative attire is not the norm for such critters. Though my occasional attire isn't particularly, either. Nice to have the luxury of working out of the house! I've always wondered where the best city is in the world for girls like us to feel average in height? Also, your famous females if height would I think well complement a famous females of height shoe sizes so us taller girls can also compare that not only are there tall girls but that their feet are proportioned and thus possibly larger like ours!